Fall is here again and we are rejoicing about the cool weather. It felt like yesterday when the sun was shining and we were all going to the beach to swim, relax, and sunbathe. You know the season between summer and fall, where the weather can't decide whether to be hot or cool? Well, I call that season Falmmer. I think Falmmer is the perfect season to start thinking about customizing your pets for autumn. It is finally time to look into your safety deposit box and the back of your closet and pull out all the cool and cold weather clothes you have stashed in the back during the warm seasons. In this customization we only focused on two aspects of customization. They are Neocash (NC) and Neopoints (NP). The idea is to give owners ideas on how to customize their pets for the cool weather. NC: If you are fortunate enough to have access to the NC Mall and have neocash on hand, you are able to buy beautifully designed outfits to customize your pets. To get NC, you need to buy a card in the real world, redeem it on the site, and start buying. NP: We can all get some NP from doing a variety of different activities on the site. 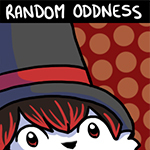 From games, collecting dailies, to selling/trading/auctioning of items, and investing in the stock market, making NP around the site is easy and in most cases, fun. Customization is subjective, and to us, these six looks are some of the best looks for the season. We love autumn, so the month of Gathering is the perfect time to clear out your closet and switch out your summer clothes for the fall season. City Girl in the Country: I really like the idea of breaking away from the city to appreciate the autumnal foliage in the country. 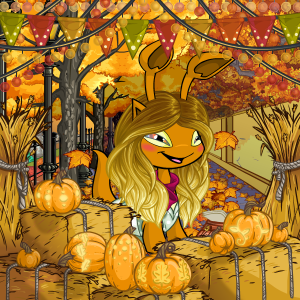 So my neopet is in the country enjoying apple and pumpkin picking. The country is the best place to observe all the changing colors of fall. To give the illusion of having cold weather, layering and putting a scarf on your pet is one of the best ways. Of course the background also helps in that aspect. Model is Wearing: Autumn Pennant String Lights, Big Bow Scarf, Cosy Cooking Clogs, Dyeworks Green: Blue Polka Dot Dress, Golden Ombre Wig, Rosy Cheeks Face Paint, Stained Glass Contacts, Stuffed Satchel, Autumn Pumpkin Display Foreground, and Golden Leaf Lined Street Background. The Country Life: In this look I wanted to go for the scarecrow affect in an autumnal open field. 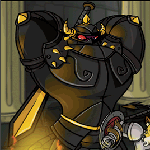 You can't see it now, but my neopet is holding the new Collectors Crokabek. Unfortunately, I don't have an open field background. But I think the one I used work just as well. Remember, you don't have to find the perfect background. Find something comparable, and then cover it with foreground and high ground items to give you the look you're after. Model is Wearing: Basic Beanie and Cherry Wig, Playful Scarecrow Makeup, The Duchesss Collectors Crokabek, Carnival of Terror Clown Pants with Suspenders, Fall School Shirt, Hanging Lanterns and Leaves Garland, Breezy Autumn Path Background, and Premium Collectible: Wheat Field Foreground. The Farm Girl: As you can see, my country side theme from my scarecrow look carries on to the farm girl. They are both from the same farm, but this look has all neopoint items. My kacheek woke up early, as most farmers do, to rack a pile of fallen leaves that have blown towards her corn field. 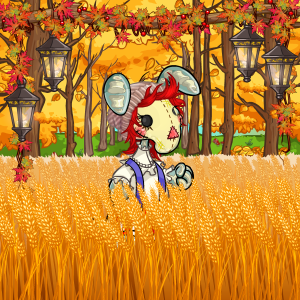 I really like this background because corn is harvested in the fall and it fits with my theme. I think this background is often overlooked, but can work for many customizations with a little bit of imagination. Although this look is for the most part NP, I had to use one NC item, the earrings. If you have a chocolate kacheek, then you know that this earring is the ONLY thing that can take away the icing on top of their heads. Her wig is covering it, so you really can't see it. I went with the sundial watch because it just seems like something a farmer would have. You can turn my girl kacheek into a boy by using the Suave Dark Wig. The transition is seamless. 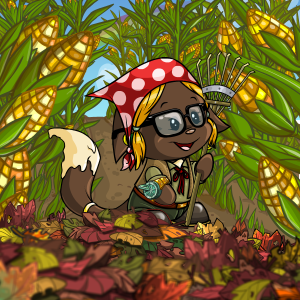 Model is Wearing: Beautiful Autumn Leaves Foreground (6,000+ NP), Black Square Glasses (2 million NPs at the trade post), Corn Field Background (3,000+ NP), Kacheek Farm Girl Wig (14,000+ NP), Lost Desert Kacheek Tail Ring (Paintbrush), Rugged Kacheek Boots (10,000+ NP), Rugged Kacheek Shirt and Waistcoat (4,000+ NP), Rugged Kacheek Trousers (10,000+ NP), Simple Wooden Rake (10 NP), and Sundial Wriswatch (700+ NP). The nights are getting darker and the autumn rain and weather is colder. Walking outside in the rain in the evening with an umbrella is something I adore. So it was a no brainer to go for a rainy themed look for my customization. I decided to focus my customization on a beach with the cozy city lights behind her. She is wearing the latest autumn fashion, a romper piece along with a fancy jacket and a scarf. I paired her look with a necklace, makeup, and wig. This look works perfectly for her. Also, this customization is made of only NC items. If you want to add some NP items to your outfit you can consider the Sky Line Skirt, Fur-Trimmed Coat and Fur-Trimmed Boots. Model is Wearing: Golden Key Necklace, Dyeworks Brown: Side Swept Blond Wig, Rosy Cheeks Face Paint, Floral Romper, Ruffles and Rivets Jacket, Simple Autumn Infinity Scarf, Cosy Cooking Clogs, Dyeworks Pink: Rainy Day Umbrella, Dyeworks Yellow: Peaceful Tree Garland, Distant City Lights Background, Windy Autumn Fence, and Fiery Sun Contacts. Autumn is the perfect season to gather and enjoy nature. 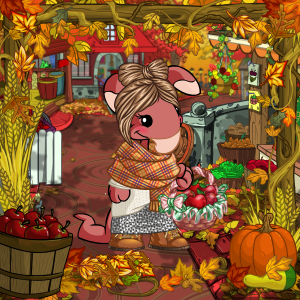 For this look I decided to go for a harvest market theme. The autumn harvest market is the perfect place for everyone to come and enjoy each other's company, not to forget the delicious treats of course. At the market you can find the latest autumn themed handmade food and clothes for your pets. I used a cozy big scarf and a warm sweater. The basket is perfect for apply picking. To look extra stylish I gave her an adorable wig and facepaint. If you have a male pet you can use the Basic Beanie and Tangerine Wig, Layered Fall Jackets and Khaki Trousers with Cuffs to achieve this look. Model is Wearing: Extra Plaid Scarf, Tucked In Sweater and Skirt Outfit, Autumn Lace Boots, Basket of Apples, Bow Bun Wig, Rosy Cheeks Face Paint, Harvest Frame, Autumn Market Background, and Falling Autumn Leaves Shower. The long summer is over and autumn has finally arrived! Outside you can hear sounds the new season brings. From birds flying in the sky heading south to autumn's music of leaves crunching under your feet as you walk, sounds of autumn is everywhere. Music is something I love and everyone can enjoy, so that's why I decided to go with a music theme. 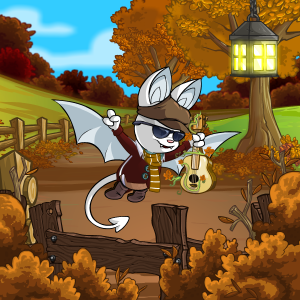 My cool Korbat is pumped for the season. He is outside playing his guitar to welcome fall. To add to his cool look I added sunglasses and a hat. If you want to make an outfit for your female pet you can use the Black and White Trendy Dress, Veiled Autumn Hat and Bright Red Lipstick. Model is Wearing: Dilapidated Fence Foreground (10 NP), Lantern of Holiday Cheer (1,000 NP), Autumn Shrubbery (3,200 NP), Jazzmosis Glasses (3,700 NP), Autumn Country Road Background (5,000 NP), AAA Host Trousers (32,000 NP), Brown Newsboy Hat (1,000 NP), Brown Winter Scarf (150 NP), Autumn Guitar (5,500 NP), AAA Host Shirt and Jacket (200,000 NP), and AAA Host Shoes (98,000 NP). Thank you for taking the time to read our article. 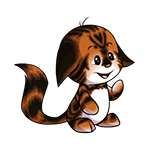 And if for some reason you didn't read it, at least you got to view our customization ideas and what we think looks and works on our neopets for autumn. If you have any comments or questions, please feel free to contact us. Enjoy the cool season because there are lots to do and even more to eat. Enjoy.